Smith’s novel has the potential to be cheesy and clichéd, but the authenticity of the connection that Graham and Ellie feel keeps the story somewhat grounded. Smith’s characters also are surprising and funny, resisting the Hollywood-meets-real-world tropes that are often overdone. As Smith slowly delves deeper into Graham and Ellie’s pasts and their own story together, the complicated feelings that each character has towards each other and their parents lead the plot in unexpectedly interesting and emotionally charged directions. 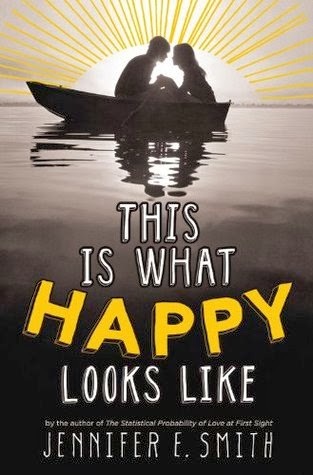 While not as memorable or as serendipitous as The Statistical Probability of Love at First Sight, This is What Happy Looks Like is a romantic book that satisfies. Cover Comments: I like the black and white photograph with the colorful design on top. Very whimsical and pretty, and it matches the story well. I'm always up for a satisfying romance, especially at Christmas! I'll look for this. I think this one sounds rather cute!